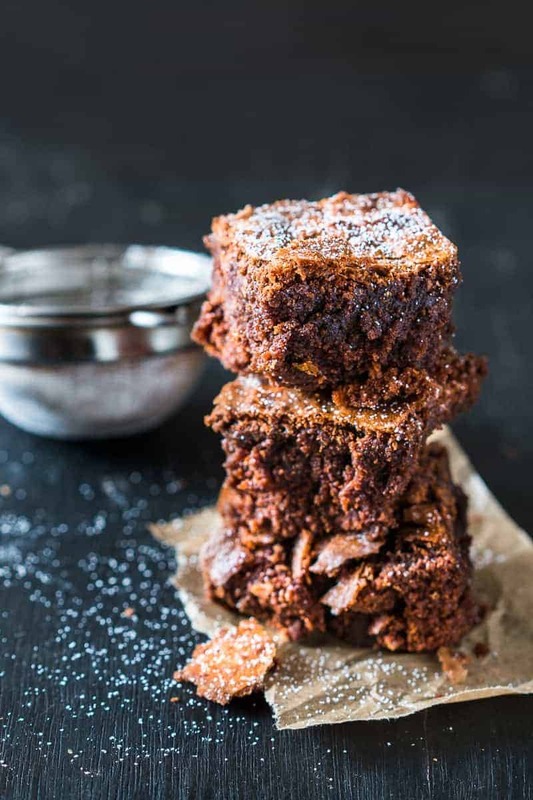 Would you believe it if I told you that these super fudgy, super chocolatey and insanely delicious gluten free chickpea flour brownies have ZERO All Purpose Flour? Like zilch. Just between you and me, baking isn’t my strong suite. I actually don’t enjoy it much because it’s too much precision and too much science and I’m more a dump-into-the-pot and let’s see what happens kind of person! Because you know that is more fun. You get to experiment a lot more with cooking and just create. Baking is more re-invent and build on something. When KitchenAid India asked us to create recipes with chickpeas, I was like game on. I have no idea why I said I’d do brownies and then basically hit myself on the head five times after I sent that mail. Coming from someone who only does the basic eggless brownie best and has been a brownie failure many times except with oreo stuffed chocolate brownies; chickpea brownies? Really Richa what were you thinking! But boy am I glad I took the challenge! 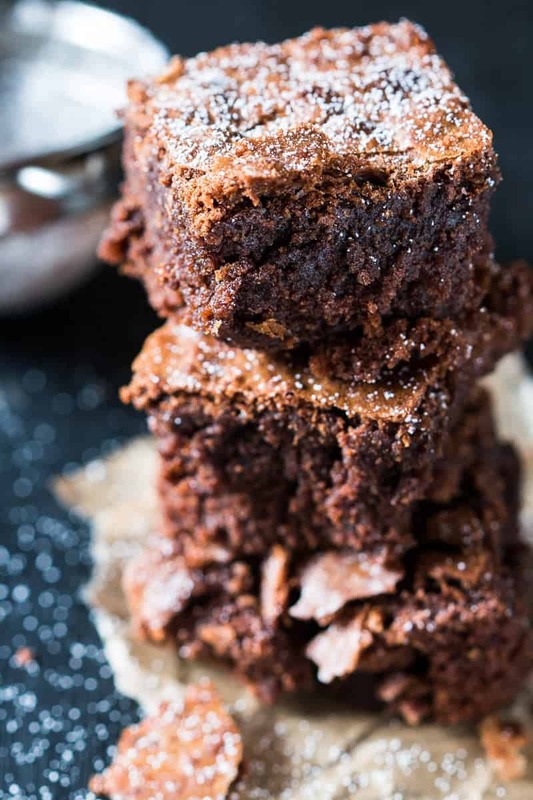 These are fudgiest, chocolatey brownies you are ever going to bite into. And they are completely gluten free for all my friends who need to avoid gluten. The chickpea flour makes them waaaay healthier than regular maida or all purpose flour would, and you can’t even tell. When I developed this recipe, Denver wasn’t around but I tested this on a gazillion friends and there was a thumbsup. We played the whats-in-this-brownie game over and over again. Ha. Too much fun I tell ya! But seriously who is in for these crackly crust, fudgy inside, super chocolatey chickpea flour brownies? Guys I really don’t think I’m ever going back to making brownies with regular APF again, because chickpea flour or besan is a heavier flour in general, which is why it works beautifully with these brownies! Brownies need to be fudgy instead of cakey and you get that so naturally here. 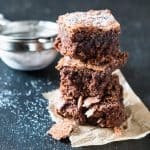 Now give me a high five for chickpea flour brownies and let’s get baking because we need these in our lyyyfeeeeee so bad! Easy, gluten free brownies made with chickpea flour (besan) are fudgy, chocolatey and irresistible! You will never guess that there is no all purpose flour in this healthy treat. Pre-heat oven to 350 F/ 175 C.
Grease a 8X8 inch square tin with butter. In a microwave safe bowl, add butter and dark chocolate and microwave for 30 seconds to a minute till the chocolate starts melting. Whisk together till smooth and set aside to cool. Beat together eggs and sugar for 2-3 minutes till creamy. Add the chocolate mixture and vanilla extract and whisk again. Sift in salt, cocoa powder, besan, and coffee powder and fold into the wet mixture. Pour the brownie batter into the greased tin and bake for 30-35 minutes. Let them cool completely before slicing and serving. I am a part of KitchenAid India’s Culinary Council and have been compensated with products. After trying them out, I love their range, which you can check out here. Are you a brownie lover? Check out these recipes too! Hello can we use coconut oil instead of butter for vegan option ? Super delicious. And my 6yo loves them! Was looking for ways to use up chick pea flour. This is really tasty! And handy for the two coeliacs in my household – thank you. Awesome!! Thanks for your feedback Kathryn! Can you use xanthan gum instead of eggs and if so how much ? I don’t like coffee, can I leave it out? Is there something else I could add? Yes you can leave out the coffee, though you really can’t taste it in the recipe. The coffee is just there to enhance the chocolate flavour. These came out really good! I put them in 12 muffin tins and baked for ~21 minutes. They came out slightly dry, so maybe I overbaked or wasn’t careful enough measuring my chickpea flour, but they’re still delicious and perfect with some ice cream. I’ll definitely make them again! So glad you liked them Luna. They should actually be quite moist, so try baking them a little less next time. Hey Amy! The instant coffee enhances the chocolate flavour. But feel free to leave it out if you want. I had a large batch of strawberry’s left over and was anxious to try out an idea as a yummy desert. I followed your recipe and it was so easy to make (https://myfoodstory.com/easy-gluten-free-chickpea-flour-brownies-recipe/). The result was more of a cake than a brownie; but result was yummy. I used a round 8×8 cake pan rather than the sheet. I sliced into 8 wedges, then each wedge sliced down the middle. Bottom half covered with strawberries and then topped with the top half. Brushed lightly the top with Baileys Chocolate Cherry Liquor and dusted with powdered sugar. Just a spoon of whipped cream and garnished with a strawberry. Very nice desert. Thank you for the idea! Had to take a picture to show my friends. Impressed. Richa Gupta your creative brownie is so nice. Keep blogging more creative dishes. I am so excited to try these! One problem, you lost me at “coffee” – I HATE the taste of coffee/mocha and I can pick it out of anything! 🙁 LOL – will it matter? is there a substitution? Hey Christine – honestly you won’t even notice the flavour of coffee. Its there because it enhances the chocolate flavour in the recipe, but if you absolutely hate it – you can leave it out. So glad you liked them Janet. Thanks for letting me know! I’m keen to try this recipe. It looks so good! I just need clarification on the dark chocolate. Did you use chocolate chips? I use bar chocolate for cooking and it’s hard to measure in volumes like 1/2 cup. A weight would be so helpful. How many ounces or grams did you use? Can’t wait to taste these! Ok dumb questions, 1/2 cup dark chocolate is that unsweetened like bakers chocolate or sweetened? Do you measure it melted? Hey Shawn, not dumb at all! I used sweetened dark chocolate and measured it unmelted. I hope you try this recipe! And there’s no baking powder or baking soda? No, the eggs help the brownies rise a little bit. I don’t have an oven. Do you think these can be made by steaming? Shari I’ve never tried steaming brownies. But if you’ve made brownies by steaming them before, then I don’t see why not! Hey Anjli, yes chickpea flour and besan are the same thing. I hope you try these out! Richa, I can not wait to give these a try. I love using chickpea flour and these look out of this world. This is so amazing Richa.. Thanks Heather, I hope you give it a try! Can I do this recipe in the microwave? If yes, then for how long should I keep it in the microwave? 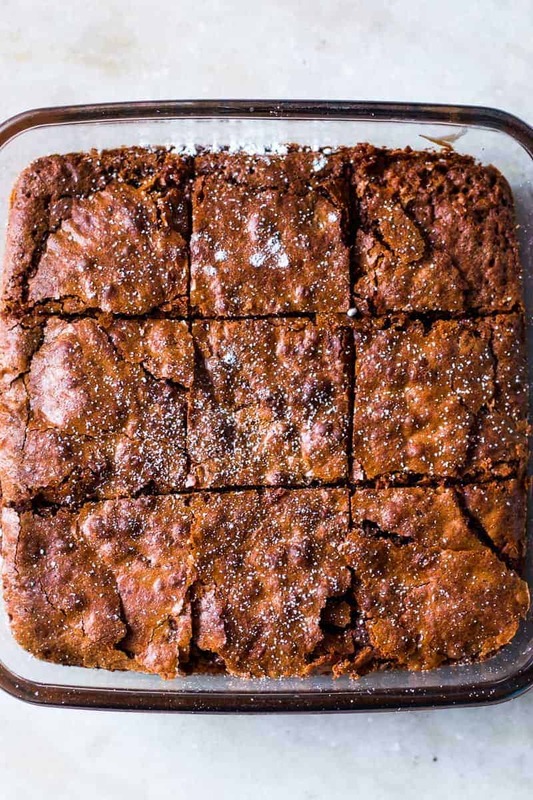 Wow, brownies with chickpea flour sounds very very interesting. Love the texture you git there. Will have to try these for my kids. im not a huge baker either..i cant wait to try these..sounds so fudgy and delicious!